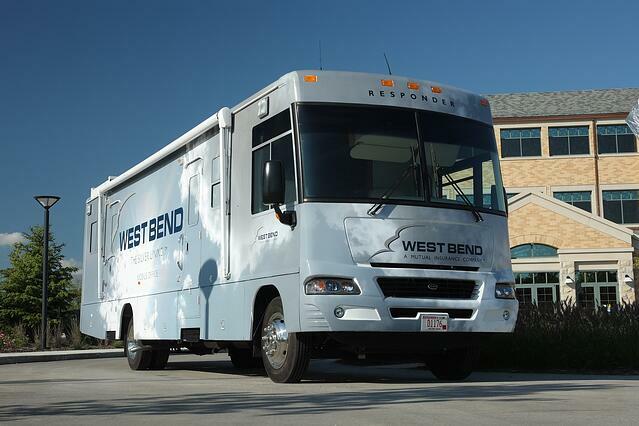 West Bend has taken Silver Lining service to the next level with Responder®! Our fully-functional mobile office, designed especially for West Bend, has revolutionized the way our storm response team handles large-scale catastrophe claims! Responder is a 35-foot commercial vehicle custom designed as a mobile office that travels to areas throughout the Midwest where West Bend policyholders have been hit by such severe weather as heavy hail, windstorms, or tornadoes. Upon arriving at the affected area(s), Responder's disaster team inspects damage to policyholders' vehicles. Claims are immediately processed on-site and checks distributed, significantly expediting the claims process. The Responder is outfitted with the latest in satellite and wireless technology, allowing team members to work out of the vehicle as if they were at an office. With Responder at the scene, the claims process is streamlined and claims are handled at the location of the catastrophe.